Sisters at Villa Assumpta in Baltimore came together December 6th for the Feast of St. Nicholas. Our sisters paired up for prayer partner day. Sister Theodore Baccala chose Sister Magdalita Wyczalek as her prayer partner. “I’ve known her for a long time, I’ve know her for 36 years,” Sister Theodore said. 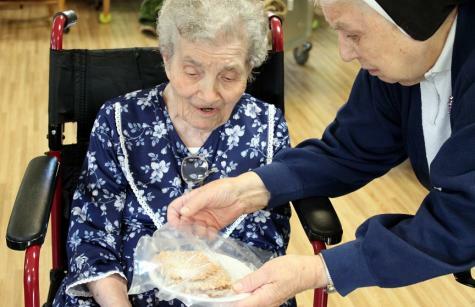 Sister Theodore is famous for her pizelle cookies, and she brought Sister Magdalita a special batch. Sister Magdalita, now 102-years-old, had a long career in education. She taught at schools in New Jersey and Baltimore. And Sister Magdalita says her passion for teaching is still alive inside of her. “I don’t want to be finished, I love to teach,” she said. Please help us wish Sister Magdalita early birthday wishes. She turns 103 on January 11, 2017.